PIR (Passive Infra Red) sensor is an occupancy sensor switch that detects the Infrared rays released by human body motion within the detection area. This model works on its own and will not synchronize with other sensor switches inside a room for turning on or off the luminaires and devices. The luminaires will be turned on while the room is occupied and off when the room is empty. The Group assignment is done by turning the dial at the side of PIR Sensor, and the corresponding DALI Groups are listed as follows. 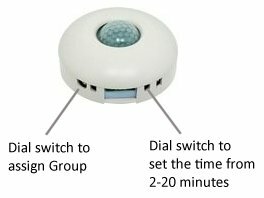 A range of waiting time from 2-20 minutes can be pre-set by turning the dial at the side of PIR sensor. 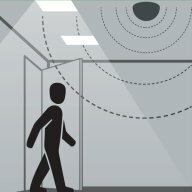 After the room is not occupied for the pre-set time interval, the PIR Sensor will send out a DALI command to turn off the luminaires. 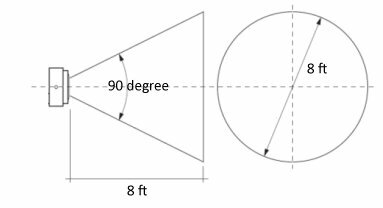 ?/font> Position the PIR Sensor not directly exposed to sunlight or other heat sources, such as heater. ?/font> Only one PIR Sensor is installed in one room for detection of occupancy purpose. ?/font> Set the appropriate waiting time from 2-20 minutes to turn off the luminaries when the room is not occupied. ?/font> The PIR Sensor will turn on the luminaires by sending out the DALI command (RECALL MAX LEVEL) to the selected Group, as soon as the occupancy is detected.